Simply Nerdy Mom: Fun Date Night Ideas With Date Box Club + GIVEAWAY!! Fun Date Night Ideas With Date Box Club + GIVEAWAY!! My husband and I will celebrate our 9 year anniversary this November. We also have a 3 year old son and our daughter is almost 9. Do the math. We've had at least one kid the entire time we've been married. We always do things as a family, but I feel it's important to have one on one time as adults as well. Date nights help strengthen the marriage and I feel are an essential part of reconnecting. Our date nights are once a month and usually consist of us going out to eat and to see a movie, but we like to do things at home when we can as well, either when we can't afford to go out or we want to have an extra date night or two at home. Because we've been together for so long, it's hard to come up with new ideas for date night. Movie nights are fun, sure, but sometimes you just need something new and more hands on with more opportunity for communication, which is very important. Thankfully, there's Date Box Club! 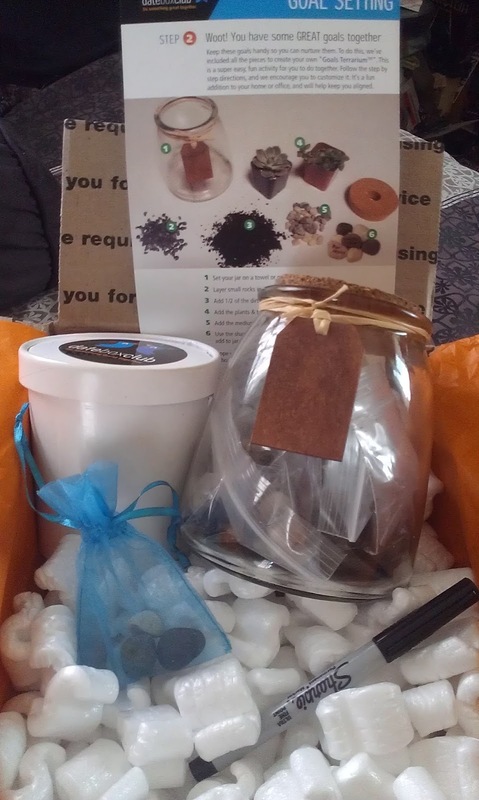 Each month, Date Box Club sends you a themed box with items you and your partner can do together that will get you communicating and strengthen your bond and relationship. June's Date Box Club had items in it to make a Goal Terrarium, which is not only adorable, but I plan on displaying it at our vow renewal for our 10 year anniversary next fall. I love that everything you need is in this little box. There's a goals card, which gets you talking and you can discover what your goals are for the relationship, both as a couple as well as individuals. 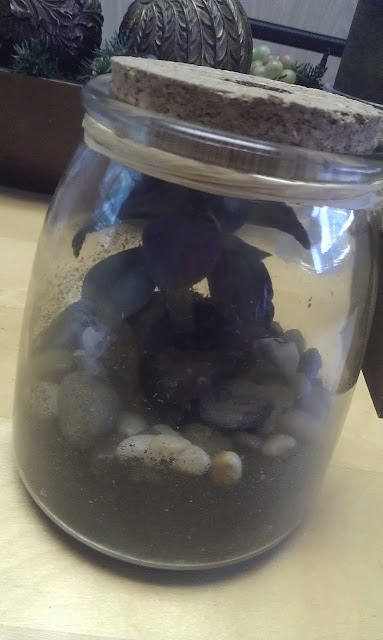 Once you've talked about and written your goals on the card, you can then start building the Terrarium. 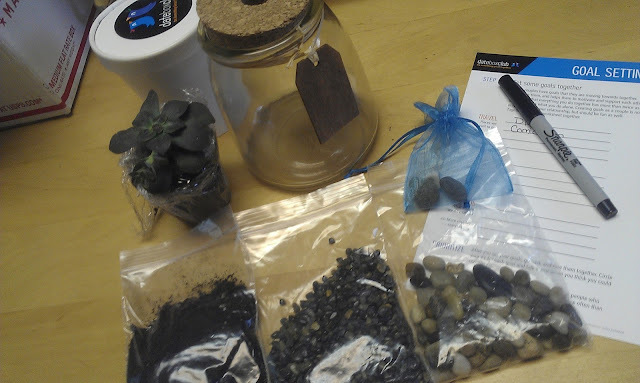 They provide you with a Sharpie which you can use to write your goals on the little rocks and put them in the terrarium with the plants, which can then be displayed in your house as not only adorable decor, but a reminder of your relationship goals. I would have never thought of this on my own because i'm either not very creative or we've already done everything I can come up with dozens of times. It's nice to have something new and fun every once in a while. Sign up for their mailing list HERE and get a FREE mini-date download! That’s right a mini-date. We love quick little spontaneous dates. Our popular “50 Questions to Ask Your Partner Over Dinner” is a perfect conversation starter that will transform your dinner conversation. No babysitter necessary. The .pdf is formatted to print at home, and cut in half. Each partner takes turns – asking and answering. These aren’t your every day conversation starters, these are designed to peek your interest. I would go to Las Vegas to visit family! FUN !!! My husband and I would go cross country and visit the states that we have yet to visit (mainly in the north west) so that we can say we have visited all 50 states! Basically everything west of Nebraska. My husband and I would go to Connecticut. I was born and raised there. Lived there for 25 years. Got married and haven't been back in 8 years. I miss it. Would be a great chance to go back home! I dont have a significant other but I would give this prize to my sister so her and her boyfriend could go on an adventure on her off chemo weeks! We would travel to Washington. It's always been so pretty in pictures with lots of things to do there. My husband and I would go out west and visit each western state. I've never been there, except for Colorado. We'd go to Oklahoma to see some of my husband's relatives. I haven't met a lot of them yet and I would love to do that.